Jin Yong's novels are filled with exceptional and rare women matched with the male heroes of his stories, some of the more popular and notorious being Yeung Gor/Siu Lung Liu and Kwok Jing/Wong Yung. While it is of course sweet and nice to see our heroes paired with a beautiful girl, it is also one of the criticisms I have always had with Jin Yong's works. His women characters are almost always described as the most beautiful when compared to the other female characters in that story if they are to be loved by the main hero at the end. Is it really as the Chinese saying goes that a hero finds it difficult to pass the obstacle of a beautiful woman or is it trademark in Jin Yong novels? In "The Legend of the Condor Heroes", Wong Yung is certainly described as more beautiful than Kwok Jing's betrothed, Wah Tsang princess. In "The Return of the Condor Heroes", it was undisputed that Siu Lung Liu's (Dragon Girl) beauty surpassed all other women that Yeung Gor met. Yeung Gor was always comparing other women with Siu Lung Liu, deeming that they were inferior in beauty. In "The Heavenly Sword and Dragon Saber", Cheung Mo Kei's true love was undetermined but his love interests were all rare beauties of his time. Chan Ka Lok in "The Book and the Sword" fell in love with the Fragrance Princess--the prized beauty that even emperor Qian Lung lusted after. Ling Wu Chong in "State of Divinty" finally loved Ying Ying, who to him was also more beautiful than his martial sister. 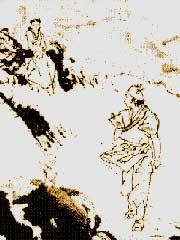 Yuen Chi Yi of "Other Stories of Flying Fox" and Mui Yurk Lan of "The Flying Fox of Snow Mountain" were both loved at different periods by Wu Fei. In "Other", my favorite female character was the Poison-Doctor's disciple, Ching Ling So, but alas, Jin Yong had penned her down as thin, dark-skinned, and not very attractive. I am always sad that Jin Yong could not make Wu Fei love her. Wai Siu Bo of "The Duke of Mount Deer" had seven beautiful wives--need I say more? Perhaps my favorite Jin Yong couple is Kiu Fung with Ah Chu of "The Demi-Gods and Semi-Devils". In all the other novels, the male heroes are firstly entranced by the beauty of the female character which then developed into love. With Kiu Fung, it was quite different because the first attraction was not physical, making their love more real and cherishable. Ah Chu was not even supposed to be very beautiful. However, Duan Yu of the same novel did fall the hardest for the most beautiful Wong Yu Yuan and was madly infatuated with her beauty.